Here you'll find a bit more information about alanmccann.co.uk itself, how the site was built and how to make the most of your visit. This site exists to promote my design work specifically and my other work generally. The focus is on my digital design since this lends itself best to an portfolio although there is some coverage of my other work, especially in publishing. This site was built using Photoshop CS and Dreamweaver 8. The homepage was designed within Photoshop and sliced and exported using ImageReady. 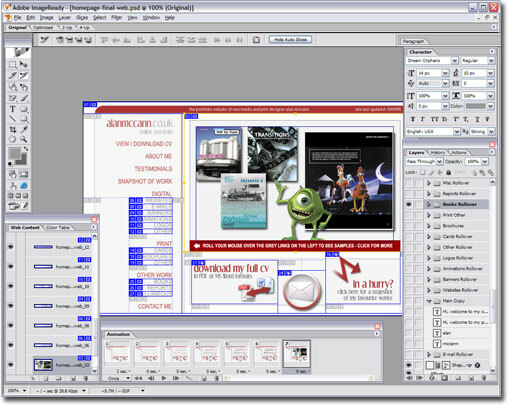 ImageReady was also used to animate certain sections and provide basic rollovers. Image swapping behaviours, which provide the portfolio rollovers of sample work, were added separately within Dreamweaver and the homepage was finished off. For the general site pages, a Dreamweaver Template was designed from scratch using the navigation bar from the homepage as a basis. This Template allows new navigational elements to be added and updates every dependent page on the site automatically, making alanmccann.co.uk inherently easier to update. The left-hand side panel images provide illustration throughout alanmccann.co.uk. These images are not necessarily designs by me or photographs taken by me, but more general illustrations from projects I have been involved in, designed to add some colour to the site and occasionally draw interest to other sections.